I have notified our readers already that Dresden was almost exclusive geographic place for creating chef-d'oeuvres in April. Also, I have notified in the report on May 29 that I have managed to find nice games untouched by other commentators. But see at first a game by one of the heroes of European championship who displayed himself in another April tournament – both in result and creativity. 1.e4 c5 2.¤f3 ¤c6 3.d4 cxd4 4.¤xd4 ¤f6 5.¤c3 d6 6.Ґg5 e6 7.Јd2 Ґe7 8.0-0-0 0-0 9.f4 ¤xd4 10.Јxd4 Јa5 11.e5. In the main line of the variation White moves the pawn to e5 after 11.Ґc4 Ґd7 keeping middlegame on the board but permitting Black to develop his light-squared bishop: 12.e5 dxe5 13.fxe5 Ґc6! 14.Ґd2 ¤d7 15.¤d5 Јd8 16.¤xe7+ Јxe7 17.¦he1. The position arisen is rather for theoretic review. 11...dxe5 12.Јxe5. White has to capture by his queen here as after 12.fxe5 ¦d8 13.Јf4 ¦xd1+ 14.ўxd1 ¤d5 he stands worse. 12...b5!? A novelty. Kotronias cleverly declines trading the strongest pieces. If Black, without thinking, retreats 12...Јb6? then after 13.¤a4! his queen would feel quite unhappy: 13...Јc6 14.Ґb5 Јxg2 15.¦hg1 and then Ґxf6; or 13...Јb4 14.¦d4 0-1 Kramer – Kottnauer, Beverwijk 1954; or Јf2 14.¦d2 0-1 again, Barczay – Szilagyi, Hungary 1998. A very nice-looking trap easy to fall into as it seems at first glance that the queen has at least half the board in its possession. Black always used to play 12...Јxe5 13.fxe5 ¤d5 14.Ґxe7 ¤xe7 15.Ґd3 b6 16.Ґe4 ¦b8 17.¦he1 Ґb7 and used to equalize on the whole. Kotronias himself successfully played this endgame against Westerinen (Gausdal 1995) but this time he decided to pose more difficult problems to himself and his opponent. 13.¦d3!? A position after 13.Јxb5 Јc7 resembles a popular scheme of Dragon variation. Black has compensation for a pawn and needs no to be very resourceful – he must just put his rooks on open files and checkmate. Cheparinov finds a reasonable and aggressive idea. Since Black permits the white queen to stay in a good central position, White may try to start an impetuous onslaught on the opponent's king. 13...¤g4. 13...h6 is unwise. White always can find perpetual check after 14.Ґxh6 gxh6, but one who knows games by Tal and Kupreichik well will suspect immediately that attacking possibilities are not limited by the line. 14.Јe4 f6!? After thorough analysis one may try 14...Ґxg5 15.fxg5 b4 (weaker is 15...¤f2 16.Јxa8 ¤xh1 because White can choose between 17.¤d1 and something else) 16.Јxa8 ¤f2 (16...bxc3 17.¦xc3 is bad and in case of 16...Ґa6!? 17.Јxa7 Јxg5+ 18.¦d2 bxc3 19.bxc3 Ґxf1 20.¦xf1 ¤xh2 Black lacks exchange plus White has a passed pawn) 17.¤d1 (strictly only move) 17...¤xh1. The knight stuck in the corner, but still alive. The position is recommended to those who like to get out of dubious situations. 15.¦h3! 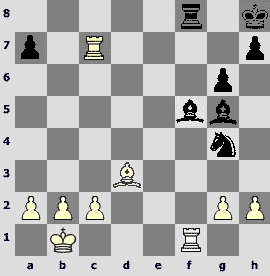 15.Јxa8 fxg5 is no good as White cannot defend from both b5-b4 and ¤f2. 15...g6. The king needs care. Elementary loses 15...fxg5 16.Јxh7+ ўf7 17.Ґd3. In case of 15...h6 a decisive manoeuvre is more complicated and elegant – 16.Ґd3 f5 17.Јxa8 hxg5 18.Ґxf5! exf5 19.Јd5+ ¦f7 20.¦h8+! 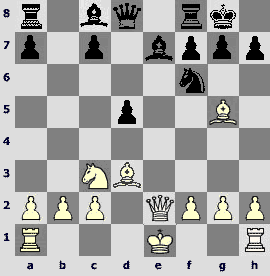 ўxh8 21.Јxf7, and one of the bishops is lost (21...Јd8 22.¦e1). 16.Јxa8. 16.Ґh6 ¦d8! 17.Јxa8 b4 18.¤b1 b3! 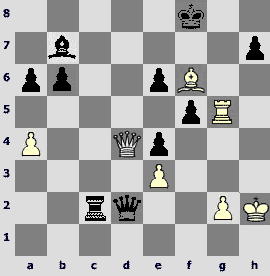 19.Ґc4 bxa2 20.Ґxa2 Јxa2 leads to disarrangement of white pieces. 16...fxg5. Black threatens with b5-b4 and ¤f2 again, but now the pawn on b5 may be eliminated. 17.Ґxb5. In case of 17.Јf3 b4! Black is all right. 18.¤d5! Excellent! Both white rooks being charged, Cheparinov puts two more minor pieces under attack! 18...exd5. In case of 18...¤xh1? 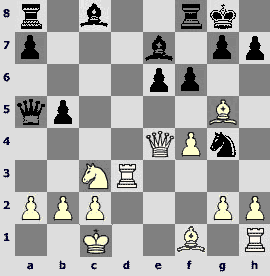 Black liquidates many opponent's battle units but not all – 19.¤xe7+ ўg7 20.Јe4!ќ Јxb5 21.¦xh7+! ўxh7 22.Јxg6+ ўh8 23.Јh6#. 18...Ґc5 led to a draw, for example 19.¤f6+! ¦xf6 (very doubtful is 19...ўg7?! 20.¦xh7+ ўxf6 21.Јf3) 20.Јxc8+ Ґf8 21.fxg5 ¤xh1(21...¦f7? 22.¦b3! ¤xh1 23.Јxe6 ўh8 24.¦c3! is no good) 22.¦e3 ¦f2 (more simple is 22...Јxb5 23.gxf6 Јf1+ 24.ўd2 Јf2+ 25.ўd3 Јf1+ 26.ўd2 with perpetual check) 23.Јxe6+ ўh8 24.Јe5+ Ґg7 25.Јb8+, and if Black does not want another perpetual check after 25...Ґf8 26.Јe5+ then the outcome is unclear – 25...¦f8 26.¦e8 Јe1+ (26...Јb4!?) 27.¦xe1 ¦xb8 28.c3! ¤f2 29.a4. In a curious variation 28...¦xb5 29.¦e8+ Ґf8 30.¦xf8+ ўg7 31.¦f1 ¦xg5 32.¦xh1 ¦xg2 Black lacks a pawn in a rook ending. 19.Јxd5+ ўh8?! Possibly, 19...ўg7 is better, for example 20.¦e3 (20.fxg5 Ґxg5+! 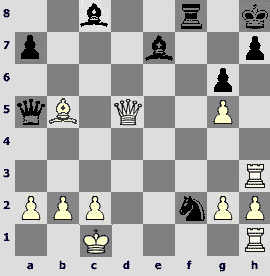 21.Јxg5 Ґxh3, and White must search for escape – 22.Јe7+ ¦f7 23.Јe5+ ўh6 24.Јe3+ g5 25.Ґc4!) 20...Ґd8! (bad is 20...Јd8 21.¦xe7+! Јxe7 22.Јd4+ ўh6 23.Јxf2 with extra material for White) 21.¦he1. In this unclear position Black parries the threats ¦e7+ and ¦e8 with the idea Јd6 by 21...ўh6! and I go further. 20.fxg5! The capture is stronger here than 20.¦e3 Ґf6! (20...¤xh1? 21.¦xe7; 20...Ґd8? 21.¦he1 gxf4 22.¦e8) and if 21.fxg5? then 21...Јb6! 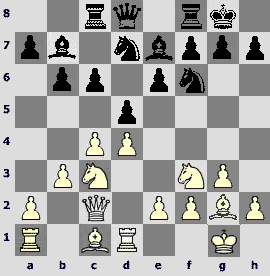 22.¦he1 Ґb7 capturing the pawn on g5 and then the exchange. Correct is 21.¦he1 Јb4 with unclear play. 20...Јb4. Black knight has no a square to move on – 20...¤xh1 21.Јe5+ Ґf6 22.gxf6, or 20...¤xh3 21.Јe5+ Ґf6 22.gxf6 h6 23.Јe7 ¦g8 24.f7, or 20...¤g4 21.Јd4+ Ґf6 22.gxf6 Јxb5 23.f7+ Јe5 24.Јxe5+ ¤xe5 25.¦e3 ¤xf7 26.¦e7 with very hard endgame for Black. 20...Ґxg5+ 21.Јxg5 Ґxh3 22.Јe5+ is bad also. 21.Јe5+ ўg8 22.¦c3! Threatening with Ґc4+ White saves both his rooks. 22...¤g4. After 22...h6 23.¦f1 Ґxg5+ 24.ўb1 Ґf6 25.Јd5+ ўh7 (25...ўh8 26.¦xf2 ¦d8 27.a3) 26.¦c7+ ўh8 27.c3 Јf4 28.¦xa7 Black is worse. 23.Јd5+. Certainly not23.Ґc4+ Јxc4 24.Јxe7 ¦f1+ 25.¦xf1 Јxf1+ 26.ўd2 Јxg2+. 23...ўg7. Again, Black might choose between g7 and h8 to retreat. 24.¦c4?! White should defend the pawn on g5 by 24.h4! and if 24...¦f5 then 25.Јc4. 24...Јd6 25.Јxd6 Ґxd6 26.¦a4 Ґc5 27.¦f1. 27...Ґf5! Weaker is 27...¦xf1+ 28.Ґxf1 ¤xh2 29.Ґe2 and the back knight needs constant supporting. 28.¦c4 Ґe3+ 29.ўb1 Ґxg5 30.¦c7+ ўh8?! Much stronger is30...¦f7 31.¦xf7+ ўxf7 saving the last pawn on the queenside. 31.Ґd3. Immediate 31.¦xa7 is met by 31...Ґxc2+! 32.ўxc2 ¤e3+. 31...¤xh2? A mistake. 31...¤e3 32.¦f2 ¤g4 would keep balance (White should not give away the pawn on g2, still 32.¦g1 is too passive). 32.¦h1 Ґxd3 33.cxd3 h5. 33...а5 is more persistent. 34.¦xa7. Escaping a simple trap: 34.¦xh2?? ¦f1+ 35.ўc2 ¦c1+ 36.ўb3 ¦xc7. 34...¤f1 35.a4 ¦f4. The last chance was in 35...¤e3 36.a5(possibly, 36.g3 is more accurate) 36...¤xg2 37.¦b7 Ґe3 38.b4 ¤f4 39.a6 ¤d5 (39...¤xd3 40.¦h3) 40.ўb2 though Black can hardly stop white pawns. 38.a6! Ґe3 39.¦a8+ ўg7 40.a7 ¤c4+ 41.ўb3 ¤b6 42.¦b8. Black resigned. It was the most complicated game in the review, the following ones will be simpler to understand. Boris Avrukh's knights during the whole game steadily moved up the board to sacrifice themselves at a crucial moment for common good. 1.d4 d5 2.c4 e6 3.¤f3 ¤f6 4.g3 Ґb4+ 5.Ґd2 Ґe7 6.Ґg2 0-0 7.0-0 c6 8.Јc2 ¤bd7 9.¦d1 b6 10.Ґf4 Ґb7 11.¤c3 ¤h5 12.Ґc1 ¤hf6 13.b3. For the sense of these skilful manoeuvres see, for example, comments to the 10th game of the match for the World Champion title. 13...¦c8. The most natural continuation. 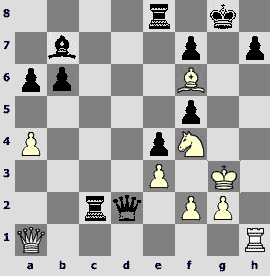 13...Јc8 14.Ґb2 b5 15.c5 b4 16.¤a4 a5 17.a3 Ґa6 1/2-1/2 J.Horvath – Z.Almasi, Austria 1998. 23...¦xc6 24.¦h4 Ґe7 25.¦d4 ¦c7 26.¦d1 Ґg5 27.f4 Ґe7 28.¦xd7 Ґc5+ 29.ўg2 Јa8+ 30.¤f3 and Black resigned. Seems all right – purposeful operations by White brought him a full point. 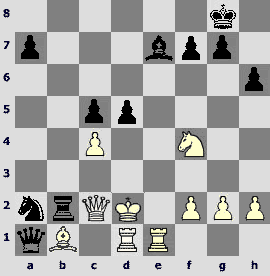 But in the diagram position Black might transfer to a safe endgame by means of imperturbable 23...¤b8!! 14...c5. Ribli offered the move in his comments to Beliavsky's games for ChessBase without much explanation – just the idea. Let us enjoy the living classic's interpretation of the variation in case of 14...dxe4. Possibly, 15.¤xe4 ¤xe4 16.Јxe4 Јc7 17.Ґf4 Ґd6 18.Ґxd6 Јxd6 19.c5 keeps slight advantage, but Alexander Beliavsky used to play 15.¤g5. b) 15...c5 16.dxc5 bxc5 17.¤cxe4 ¤xe4 18.Ґxe4 Ґxe4 19.Јxe4 Ґxg5 20.Ґxg5 Јc7 21.Ґf4 e5 22.Јf5 ¦fd8 23.Ґg5 f6 24.Ґe3 ¤f8 25.¦d5 ¦xd5 26.cxd5, and White is better again, Beliavsky – Ibragimov, Minneapolis 2005. 15.dxc5. 15.exd5 exd5 16.Ґb2 is good also, de Boer – Tindall, Wijk aan Zee 1997. If 16...dxc4 then intermediate 17.d5! threatening with d5-d6, and in case of 17...cxb3 18.axb3 the pawn on a7 is hanging. Nonetheless, Black should choose this line. 15...dxc4. 15...dxe4 16.¤e5 ¦xc5 (or 16...Ґxc5) 17.¤xd7 ¤xd7 18.¤xe4 looks suspicious as it loses time. 16.b4. 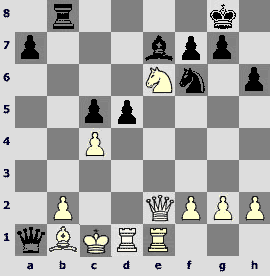 A typical movement providing White with a strong point on c4. 16...bxc5. 16...a5 17.a3 changes nothing. 17.b5 Јc7 18.Ґf4. A try to transfer the knight to c4 immediately by 18.¤d2 could be met by 18...¤b6 (worse is 18...¤e5 19.f4 ¤d3 20.¤xc4 ¤xc1 21.¦axc1 and then е4-е5, ¤e4-d6 dominating) 19.a4 a5 20.bxa6 Ґxa6 with unclear play. 18...e5. White hardly has advantage in case of 18...Јa5 19.¤d2 ¤b6 too. 19.Ґe3 ¦fd8 20.¤d2. 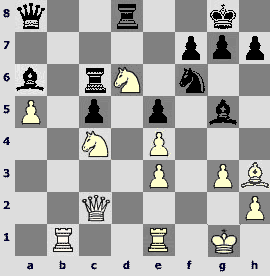 A trite 20.h3 not only deprives black knight of the g4-square but White's own bishop of the h3-square as well. After 20...¤f8 the knight goes to d4 with good play. 20...¤g4. 20...¤f8! was good-looking too, and if 21.Ґh3 ¤e6 22.Ґxe6 fxe6 23.¤xc4 then 23...¦d4! 21.a4. Nothing must prevent appearing the knight on c4! After 21.¤xc4 ¤b6 a series of exchanges follows – 22.¤d5 Ґxd5 23.exd5 ¤xc4 24.Јxc4 ¤xe3 25.fxe3 equalizing due to opposite-square bishops. 21...¤xe3 22.fxe3 Ґg5 23.¦e1 a6. 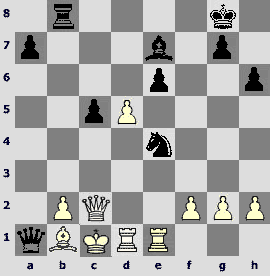 A good idea would be 23...Јd6 24.¤xc4 Јe6 25.¤d5 in order to attack the knights immediately by 25...¤f6 or 25...¤b6. 23...¤f6 24.¤xc4 Јe7 leads to nearly equal play. The text move spoils nothing but helps the opponent to make a passed pawn. 24.a5 axb5 25.¤xb5 Јb8. 25...Јc6 26.¤a7 Јh6 27.¤xc8 Ґxe3+ 28.ўh1 Ґxc8 is risky. Computer offers at first 29.¤xc4 Ґd4 30.¦ab1 ¤f6 31.¦b6 Ґe6 as a proof for mutual chances but then finds 29.¦xe3!? Јxe3 30.¤xc4 Јh6 (30...Јd4? 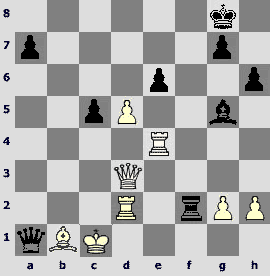 31.¦d1) 31.¦d1 with initiative for White. 26.¤xc4 Ґa6 27.¤bd6 ¦c6 28.¦ab1 Јa8? Black must not neglect the opponent's knight. Correct is 28...Јc7 29.¦ed1 (29.¤b5 Јb8) 29...¤f6 30.¤b5 Јe7 with mutual chances. 29.Ґh3. 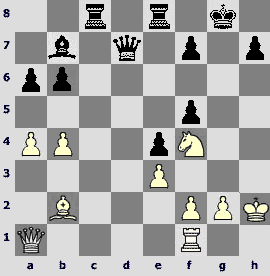 White threatens with Ґxd7 and ¤b6. 29...¤f6. After 29...Ґxc4 30.¤xc4 ¤f6 31.¤xe5 ¦a6 32.¤c4 the a-pawn would bring many troubles to Black. The opponent does not want to exterminate beautiful white knights voluntarily and Boris makes him to do it. 30.¤xf7! ўxf7 31.¤xe5+ ўg8 32.¤xc6 Јxc6 33.¦b6 Јa8 34.e5. 34...Јf3?! The last mistake. More persistent is 34...¤d5 though the position is in favour of White mostly due to the a-pawn. For example 35.Ґe6+ (35.¦d6 Ґxe3+ 36.¦xe3 ¤xe3 37.Јb3+ Ґc4 38.Јxe3 Јxa5 gives only slight advantage) 35...ўh8 36.Ґxd5 ¦xd5 37.Јe4 Ґd3 (after 37...¦d8 38.Јxa8 ¦xa8 39.¦eb1 Ґxe3+ 40.ўg2 White exchanges rooks and Black would have to give away his bishop for the a-pawn). Here 38.¦b8+ Јxb8 39.Јxd5 c4! (but not 39...Ґxe3+? 40.ўg2 Ґd4 41.e6 or 40...Ґa6 41.¦b1!) leads to an unclear position. Correct is 38.Јf3 Јg8 39.a6 ¦xe5 40.a7 ¦e8 41.Јh5!, and after 41...Ґe4!? (42.Јxg5?? 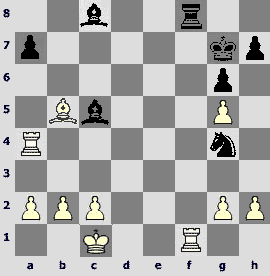 Јa2) White obtains endgame with extra exchange – 42.Јxe8 Јxe8 43.¦b8 Јg8 44.¦xg8+ ўxg8 45.ўf2. 35.Ґg2 Ґxe3+ 36.ўh1 Јf2 37.Јxf2 Ґxf2 38.¦eb1! Ґd3 39.¦b8! ¦f8 40.exf6. Black resigned in view of 40...Ґxb1 41.Ґd5+. In the next game White sacrificed valuable material for possession of empty squares. Such idealistic conception ended in a full success. 1.d4 ¤f6 2.c4 e6 3.¤f3 d5 4.¤c3 c6 5.e3 ¤bd7 6.Јc2 Ґd6 7.b3 0-0 8.Ґe2 b6 9.0-0 Ґb7 10.Ґb2 c5 11.cxd5 exd5 12.¦ad1 Јe7. The usual continuation is 12...¦c8 13.dxc5 bxc5 14.Јf5 Јe7. 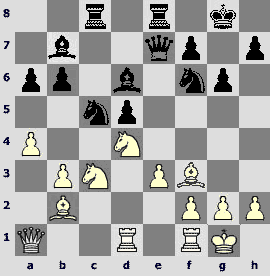 In I.Sokolov – Lautier, Amsterdam 1994, there was 16.¦fe1 Ґb8 17.¤e2 g6 18.Јg5 with a complicated play. In 1998 in the blitz match Kramnik – Kasparov they played 15.¦fe1 Јe6 16.Јb1 h6 17.Ґd3 and Kasparov rushed into unprepared complications: 17...¤e5?! 18.Ґf5 ¤xf3+ 19.gxf3 Јe5 20.f4 Јe8 – and here Kramnik might obtain visible advantage by 21.e4!. 13.¤h4 g6 14.¤f3 ¦ac8. Kramnik also tested this manoeuvre in that blitz match in order to cause weakening of the big diagonal (would it be essential, Black playing attentively?). In case of 15.dxc5 bxc5 the position from Kramnik – Kasparov would arise in which after 16.¦fe1 a6 17.h3 ¦fd8 18.Ґf1 Ґb8 19.¤e2 ¤e4 20.¤f4 ¤df6 Kasparov obtained more free and clear play. 15.Јb1 a6 16.a4 ¦fe8 17.Јa1 cxd4. Black stands good and has different plans. 17...¤e4 looks good, deserves attention 17...c4 18.bxc4 dxc4 – here in case of 19.¤d2 ¤d5 20.Ґxc4 ¤xc3 21.Ґxc3 Black may force draw by Lasker's method: 21...Ґxh2+ 22.ўxh2 Јh4+ 23.ўg1 Ґxg2 24.ўxg2 Јg4+. The text move is fully acceptable also. 18.¤xd4 ¤c5. 18...¤e5 is a good alternative. 19...Ґe5. 19...¤fe4 was possible right away, and if 20.¤ce2 then 20...¤g5 with growing initiative. 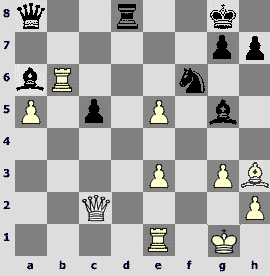 21.Ґg4 f5 22.Ґxf5 gxf5 23.¤xf5 Јf8 24.¤eg3 is a good practical chance for White, but Black stands objectively better. 23.¤f5!? The idea deserves approving even if not fully correct. 23...gxf5 24.¦xd7 Ґxh2+. I can offer less greedy 24...Јxd7 25.Ґxe5, but Nielsen, it seems, could hardly imagine that opening of the h-file can bring troubles. An ideal illustration for a complex of squares weakness. All black pieces stand on light squares except for the b6-pawn. One need not to be a highly qualified chessplayer to understand how Jaracz intends to use dark squares. 26...Јe7? Gives an extra tempo to White. 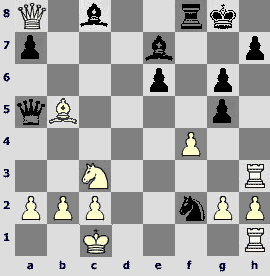 Black should pin the knight – 26...Јd6! 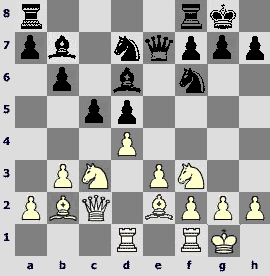 with exemplary 27.¦h1 ¦c2 28.ўg3 ¦e6 (defending the kingside) 29.¦d1 ¦g6+ 30.ўh2 ¦h6+ 31.ўg1 Јe7 32.Ґg7 (or 32.Ґe5 Јh4 33.¤h3) 32...¦d6 33.¦xd6 Јxd6 34.¤h5. If White prefers more solid 27.¦d1 Јh6+ 28.ўg1 then Black needs not to scatter his rooks on the board. 27.¦h1! 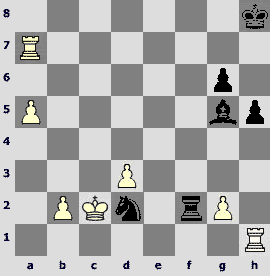 Hasty 27.Ґh8 Јh4+ 28.ўg1 Јh6 improves the black queen's position. 27...¦c2 28.Ґf6 Јxb4? Another unsuccessful move by the queen ruins the game. Again, Black must play 28...Јd6 though after 29.ўg3 ¦c6 30.Ґh8 f6 31.b5! ўxh8 32.bxc6 ¦g8+ 33.ўh2 Ґxc6 34.¦d1 Јe5 35.Јa3 the position is certainly in favour of White in spite of lacking two pawns. 29.ўg3 Јd2. After 29...Јf8 (with the idea 30.¦h5 h6) White could attack as follows: 30.Јd1 ¦c6 31.¦xh7! ¦xf6 (31...ўxh7 32.Јh5+ Јh6 33.Јxf7+)32.Јh5 ¦g6+ 33.¤xg6 Јd6+ 34.¤f4 Јf6 35.¦h6 Јe5 36.Јg5+ Јg7 37.¤g6! winning. 30.¦h5! The pawn on g2 is defended by the knight, everything else is unimportant. 30...Јxf2+ 31.ўh2 ¦e6 32.Јd4! A decisive moving to the centre of events. 35.Ґe7+! Also wins35.Јe5 Јd5 36.¦g8+. 35...ўxe7 36.¦g7+ ўe8 37.¦g8+ ўe7 38.Јg7+ ўd6 39.¦d8+. Black resigned. After 39...ўc6 40.¦xd2 ¦xd2 41.Јc3+ he loses everything. 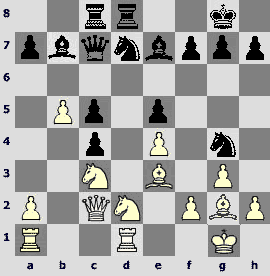 In the final example strong centralization of white pieces could not stand side attacks by the opponent. The reason is that the white king too actively took part in the centralization. 1.e4 e5 2.¤f3 ¤c6 3.¤c3 ¤f6 4.d4 exd4 5.¤xd4 Ґb4 6.¤xc6 bxc6 7.Ґd3 d5 8.exd5 cxd5 9.Јe2+ Ґe7 10.Ґg5 0-0. 11.0-0-0. If you are in aggressive mood then it is better not to play Scotch, not this scheme at least. However, Black must know something to solve opening problems. 11...Ґe6. One of the main ideas for White reveals in the line 11...c6 12.¦he1 Ґe6 13.Ґf5 with profitable trading of bishops. If 13...¤e4? then 14.Ґxh7+ ўxh7 15.Јh5+ ўg8 16.¤xe4 f6 17.Ґf4 Јc8 18.¤d2 Ґg4 19.Јg6 with an extra pawn. 12.¦he1 h6. In Groningen 1995 beautiful Sanja Vuksanovic (now Kalevic) played this variation against Oleg Korneev. Oleg chose seemingly reasonable 12...¦b8 13.Ґf5 ¦b6 but after 14.¤a4 ¦c6 15.Ґd3 ¤d7 16.Ґd2 preferred to draw the game. An analysis in 'Informant' proved that the rook on c6 stands badly. The text move by Halkias is stronger. 13.Ґh4 Јd6. Now in case of 13...c6 14.Ґf5 Black may play 14...¤e4 and after 15.Ґxe7 ¤xc3 16.Ґxd8 (16.Јxe6!? fxe6 17.Ґxe6+ ўh7 18.Ґxd8 ¤xd1 19.Ґe7 ¤xf2 20.Ґxf8 ¦xf8 21.Ґd7 ¦f6) 16...¤xe2+ 17.¦xe2 ¦axd8 18.Ґxe6 fxe6 19.f3 (sharp 19.¦xe6 ¦xf2 20.¦xc6 ¦xg2 is hardly better) 19...ўf7 he is all right, Thesing – Kosashvili, Netherlands 2001. 14.Ґg3 Јb6 15.¤b5. Neither 15.Ґf5 Ґxf5 16.Јxe7 d4 nor 15...Ґa3 16.bxa3 Ґxf5 will do. 15...c5. 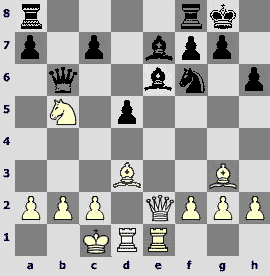 De la Villa – Zsuzsa Polgar, Salamanca 1989: 15...¦fc8 16.¤d4 ¦ab8 17.c3 and after 17...¤e4? 18.Ґxe4 dxe4 19.¤xe6 Јxe6 20.Јxe4 Јxa2 21.Јb1 Ґg5+ 22.f4 Јxb1+ 23.ўxb1 Ґf6 24.ўc2 Black obtained slightly worse endgame. However, in case of correct 17...Ґd7! Black has an excellent position. I believe the variation to be a refutation of White's plan with queenside castling. 16.c4. After 16.¤c7 c4! 17.¤xa8 ¦xa8 18.Ґg6 c3! 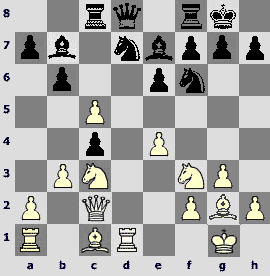 White's position is ruined. 16...¦ab8!? Quiet 16...¦ac8 is possible with quite different play. 17.Ґc7! In case of immediate 17.Ґxb8 ¦xb8 Black would play a7-a6 and d5-d4 with full compensation for the exchange. 17...Јa6 18.Ґxb8 ¦xb8 19.¤c7. 19.cxd5 ¤xd5 is to Black's benefit. Yet after fortifying 19.b3 Ґd8 a complicated struggle would follow with the unclear outcome. 19...Јxa2 20.Ґb1. 20.¤xe6 Јa1+ 21.Ґb1 leads to the same position. 20...Јa1. Threatening with deathly 21...Ґf5. 21...¤e4! A foreseen resource. In case of 21...fxe6 22.Јxe6+ ўh8 23.¦d2 Black would fail. 25.¤xd5 Ґg5+ 26.f4 Ґxf4+ 27.ўd3 (27.¤xf4? ¦xc2+ 28.Ґxc2 Јc3+) 27...¦xc2 28.¦e8+ ўh7 29.ўxc2 f5 and so on. 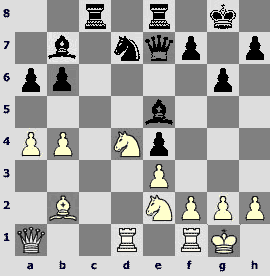 The best defence is 22.¦xd5 fxe6 (d1-square being empty, 22...¤c3 23.Јc2 ¤a2+ 24.ўd1 will not do) 23.¦h5! The rook must be ready to sacrifice itself after check from g5. Bad is 23.¦e5 Ґf6! 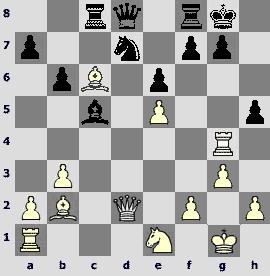 24.¦xe4 Ґxb2+ 25.ўc2 Ґf6 with a decisive attack for Black. Now on 23...g6 White has 24.Јc2: after 23...¤c3?? he checkmates – 24.Јxe6+ ўh8 25.¦xh6+, and in case of 23...Ґf6 24.Јxe4 Јxb2+ 25.ўd1 Јxb1+ 26.Јxb1 ¦xb1+ 27.ўe2 ¦b2+ 28.ўf3 Ґd4 a draw is most probable. 23...Ґf6! Better than 23...Ґg5+ 24.¦e3 ¤xf2 25.¦de1 ¤d3+ 26.Јxd3 Јxb2+ 27.ўd1. 24.¦xe4?! Possibly, 24.¦e2 is preferable but the position is joyless all the same: 24...Ґxb2+ 25.Јxb2 ¦xb2 26.¦xb2 ¤c3 (worse is 26...exd5 27.¦xd5 ¤c3 28.¦d8+ ўf7 29.¦d3 and White stands more compact) 27.dxe6 (king's march to the centre after 27.¦b8+ ўf7 28.dxe6+ ўxe6 strengthens Black's position) 27...¤xb1 (27...Јxb2+?! 28.ўxb2 ¤xd1+ 29.ўb3 ¤xf2 30.ўc4 ўf8 31.ўxc5 ўe7 – Black has little chances to promote a pawn) 28.¦d8+ (28.¦xb1 Јc3#) 28...ўh7 29.¦xb1 Јa3+, and White captures the pawn on e6 with checks. 24...¦xb2 25.Јd3 ¦xf2 26.¦d2. Also loses 26.¦de1 Ґg5+ 27.ўd1 ¦b2; 26.¦e2 Јb2+! 27.¦xb2 Ґxb2#. 27.¦f4? Capitulation. After 27.¦xe6! 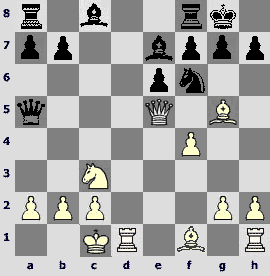 Black would have to find the only winning (and very non-trivial) continuation – 27...ўf8!! (in case of 27...Ґxd2+ 28.ўd1 Black lacks one tempo to complete the attack). Now the white queen bound to defend c3, a3, d2 and f1 squares cannot create new threats to the black king: 28.¦e3 Ґxe3 29.Јxe3 ¦f1+ 30.¦d1 ¦xd1+ 31.ўxd1 Јxb1+, 32...Јa2+, 33...Јxd5 with two extra pawns in a queen ending. 27...Ґxf4 28.Јh7+ ўf7 29.Јg6+ ўf8 30.dxe6 Јc3+. The next move would be checkmate (31.Јc2 ¦f1#), and that is the end both of the game and the review.